Often stereotyped as being apathetic to the human suffering, the American vegan movement has historically failed to build alliances with other social justice movements. As intersectional feminism gains a foothold in the movement and external political crises challenge the movement’s frame of reference, the role that identity plays in movement progress has become a serious concern. Using the 2016 election as a flashpoint, this article considers if the identity backlash characterized by the Trump campaign finds parallels in the American vegan movement. 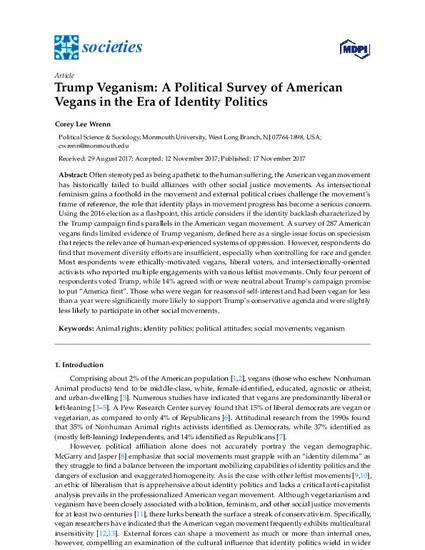 A survey of 287 American vegans finds limited evidence of Trump veganism, defined here as a single-issue focus on speciesism that rejects the relevance of human-experienced systems of oppression. However, respondents do find that movement diversity efforts are insufficient, especially when controlling for race and gender. Most respondents were ethically-motivated vegans, liberal voters, and intersectionally-oriented activists who reported multiple engagements with various leftist movements. Only four percent of respondents voted Trump, while 14% agreed with or were neutral about Trump’s campaign promise to put “America first”. Those who were vegan for reasons of self-interest and had been vegan for less than a year were significantly more likely to support Trump’s conservative agenda and were slightly less likely to participate in other social movements.